The New York Giants have signed linebacker Avery Moss and offensive guard Chad Slade to reserve/futures contracts. 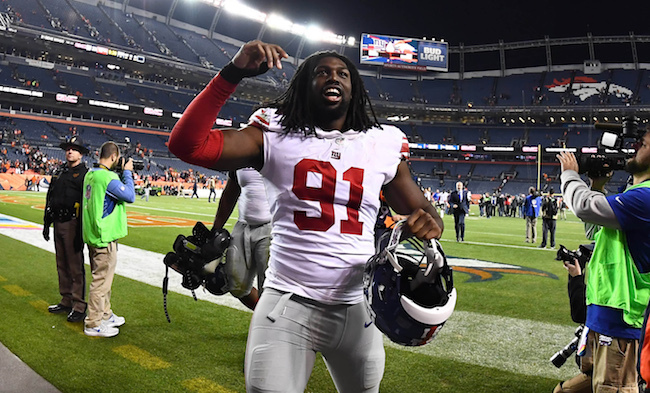 Moss, who was originally drafted in the 5th round of the 2017 NFL Draft by the Giants, spent the entire 2018 season on the team’s Practice Squad. As a rookie in 2017, Moss played in 11 games with two starts. He finished with 14 tackles, two pass defenses, and one forced fumble. The 26-year old, 6’5”, 315-pound Slade was originally signed as an undrafted rookie free agent by the Houston Texans after the 2015 NFL Draft. Slade spent his rookie season on Injured Reserve and the 2016 and 2018 seasons on the Practice Squad of the Texans. In 2017, Slade played in five games with three starts (two at right guard and one at tight end). For a listing of other players signed to reserve/futures contracts by the Giants, see the New York Giants 2019 Free Agency Scorecard section of the website. New York Giants linebacker Olivier Vernon will play in the Pro Bowl as a replacement for Chicago Bears linebacker Khalil Mack, who will not play due to an injury. Vernon was elected as a first alternate to the Pro Bowl last month. This is the first time Vernon will play in the NFL’s all-star game, joining teammates running back Saquon Barkley and place kicker Aldrick Rosas. Safety Landon Collins was also elected to play, but he will not do so as he is recovering from shoulder surgery. Vernon missed the first five games of the 2018 season with a high ankle sprain. He started the remaining 11 games, finishing with seven sacks, 30 tackles, one pass defense, one forced fumble, and one fumble recovery.